Food review? It must be contagious! I am excited to announce that my cousin Alexis is venturing into the world of food & restaurant blogging. She's my go-to gal in the Panhandle, and will be reviewing all that Melbourne, Florida restaurants have to offer! 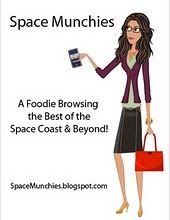 If you're ever in the area, make sure to check her blog at SpaceMunchies.blogspot.com for any recommendations. Bahahaha! And you don't think what I write on here is pure food coma babble?